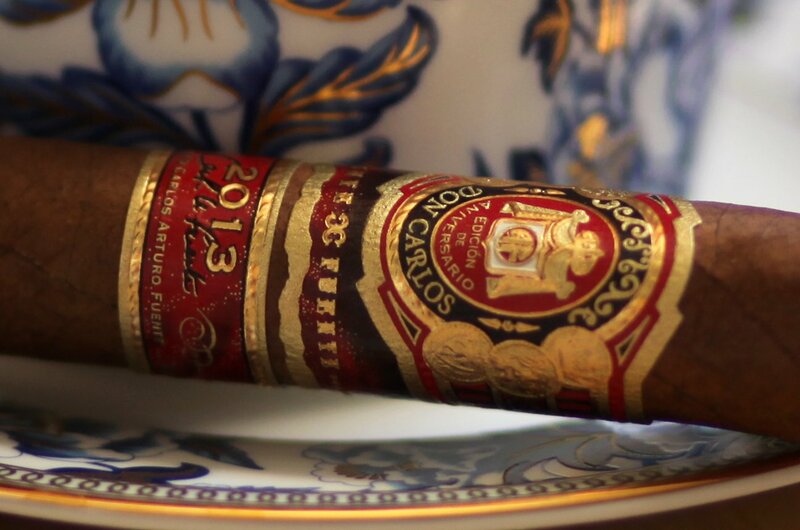 Up for review today is a special smoke from Arturo Fuente, the Don Carlos Edicion de Aniversario 2013. The standard Don Carlos line has long been revered as one of the company’s greatest cigars, so it’s no surprise that I’m excited to put a limited edition Don Carlos to the test. At $30, it’s a pricey cigar, so let’s see if it lives up to the name and the price tag. The Don Carlos Edicion Anniversario 2013 is a really beautiful cigar. The outer wrapper is light brown with dark, thin veins. It’s fairly rugged in texture. The double band is also nice, if a bit on the flashy side. Off the foot, I pick up mild spices, a bit of grass and nuts. The pre light draw is very mild, with hints of grass and almonds. The draw is slightly more restrictive than I typically like so I’m curious to see what smoke production is like. The Don Carlos Edicion de Aniversario kicks off with loads of thick, rich smoke, answering my concern about smoke production. The body and strength are both mild, and flavors include grass, spices, and vegetal and floral notes. Quite nice. About an inch in, the flavor shifts, adding some spice on the palate, as well as a really enjoyable sweet cinnamon note. The retrohale is extremely smooth, with a fine textured smoke that has hints of white pepper. The ash holds for an inch and a half before falling. The burn is wavy and requires a bit of purging to correct. At this point, I’m enjoying the smoke and wishing I had a cup of coffee with me. Good as it is, though, for $30 a cigar I’m hoping for more flavor at some point in the progression of this cigar. Heading in to the second third, it seems that my wish is granted. The strength of the smoke kicks up to just below medium, with a bit more cream and more spice right on the tip of my tongue. There’s also an additional almond note which is really enjoyable. Overall, the flavor profile is an aromatic one, with the palate leaning mostly toward salt and vegetal notes. Starting off the final third, body and strength are now at solid medium. The burn to this point has stayed very straight, with a thick burn line where the ash meets the ember. The spice on the tongue that was mild at first is now dominant and quite assertive. Behind the spice is a profile consisting of vegetal notes, slightly sweet cream, toasted bread, and almonds. The Don Carlos Edicion de Aniversario 2013 is an enjoyable smoke, but at ~$30 a cigar, it’s a tough sell. The profile leans a bit too heavily on the salty/spicy side, and I spent most of the cigar hoping that the strength would edge up more than it did. 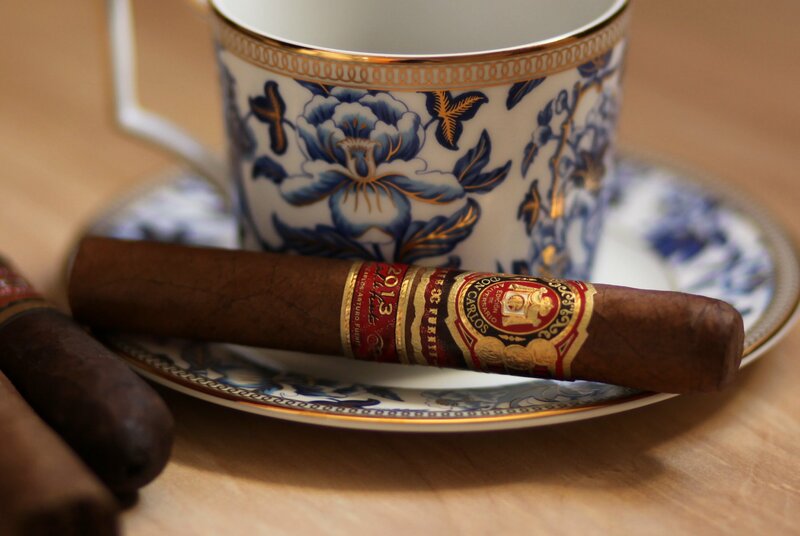 Still, the cigar offers an enjoyable profile and a decent amount of complexity. If you’re a Fuente fan and not on a budget, give this cigar a try.